Just One W.I.P: It's Gooooooood! 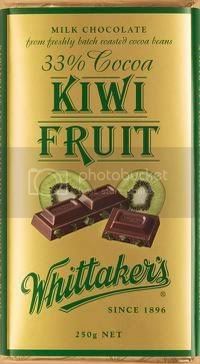 So when I decided to throw a block of Whittakers kiwifruit in the trolley a couple of months ago, I thought it would have a soft green sweet filling. I was soooo pleasantly surprised to find it has bits of dried apple and kiwifruit in it, it's delicious. So delicious that I had to share, just in case you haven't experienced the deliciousness of it yet. And it's Whittakers, of course, Whittakers is the best! twisted my rubber arm Julia! I would NEVER have thought to even try this flavour!